I got my first blacksnake whip from my maternal grandmother, Grammy Nofsker. I was six or seven years old at the time. I was both fascinated and repulsed by the whip. It seemed kind of scary, but being a young boy, I wanted to play with it. Grammy kept the whip in a drawer of a dresser that she had in her apartment, and every now and then she'd let me pick it up and hold it. I was a little hesitant each time I first looked at it, because it actually did look like a snake to me, and it took a bit of gumption for me to extend my hand toward it. I was forbidden to swing the whip around through the air ~ I might hit something and break it ~ so I was satisfied with just holding the whip in my hands. And you ask ~ how on earth was that possible? I lived in the day and age when children respected their elders, and when we were told not to do something we listened. Period. No need for a 'time out', you simply listened and behaved. The few instances when dad took off his leather belt and gave me a sharp slap across the behind was remembered when I even contemplated misbehaving. So I would just hold the whip and imagine what it would be like to 'crack' it over the heads of a team of horses to make them trot ~ or better yet, gallop ~ a bit faster. I didn't have any video game or YouTube clip to show me how a blacksnake whip should be handled, but I had seen movies in which the hero used his whip to spur his horses to pull the carriage faster. I could easily imagine what it would be like to swing the whip gracefully through the air without actually having to do so ~ against my parents' or Grammy's orders ~ and breaking something valuable in the process. So what was a blacksnake whip? Numerous leather strips were braided together around a steel or iron rod to make the handle. The braiding of the leather strips was continued for a length of about two or three feet, and then they were attached together somehow so that a single strip only extended about another two feet. The single strip of leather was usually tied into a knot at the very end of the whip. The braiding of the many strips of leather gave a mottled coloring which, in addition to the shape, did indeed look like a snake. The texture of the braided leather strips resembled snake scales and the various shades of brown of the leather resembled the coloring moreso of a rattlesnake, copperhead or milksnake than a blacksnake. A website I checked out recently noted that a blacksnake whip was one that did not have a piece of metal in the handle, and therefore could be completely coiled up, resembling a coiled snake ready to strike. The writer of that website apparently did not come from the Appalachian region of Pennsylvania, because the things that people around here always called blacksnake whips had metal rods in the handle. The blacksnake whip was not the twenty-feet long whip like the one that Indiana Jones cracked in the movies of the same name. Blacksnake whips tended to be only between four and six feet in total length. They were used by a carriage driver to spur on his horse(s) by a slight swat rather than by a skin tearing rip. The idea of the whip, when coiled up, resembling a coiled snake is an accurate description. That's why, when Grammy Nofsker would let me open up the dresser drawer, and my eyes would first catch sight of the whip, I would experience a momentary sense of fright. The object at the top of this post is only two inches long, but despite its small size, it has nicely sculpted features. My paternal grandfather gave it to me when I was young, and so I have treasured it for at least fifty years. What the picture above shows is a detail from a cigarette holder made from the material known as Meerschaum. 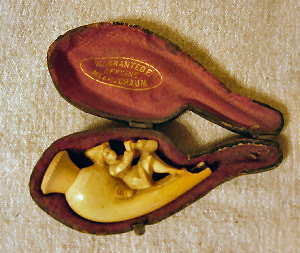 Both, cigarette holders and pipes were carved from meerschaum. Meerschaum is a substance composed of hydrous magnesium silicate; it is a mineral of the soapstone family. The substance has been known, down through the decades since the 1650s, variously as seafoam, sepiolite, White Goddess, and Venus of the Sea. At one time it was thought that meerschaum consisted of petrified sea foam, hence the one name given to it because the word meerschaum is a German word meaning simply 'sea foam'. It was given that name because it was found to be floating on the Black Sea, pieces of it having been freed from the sea bottom to rise to the top because of its porosity. Although it has been claimed that the name was assigned to the material as early as 1475, the first pipe to have been carved out of meerschaum is claimed to have been one made in the year 1652 by the French artist Louis Pierre Puget. 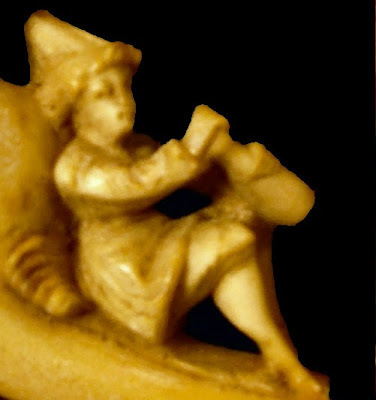 Another claim has been made by a Hungarian nobleman, Count Andrassy, who received a piece of meerschaum in the year 1723 from the sultan of Turkey, and who gave it to a cobbler at Pesth who carved pipes out of wood. What is known is that by the 1750s there was a great demand for the material and for pipes carved from it. Objects, such as pipes and cigarette holders made from meerschaum were expensive, and therefore a commodity purchased or commissioned by only the rich. 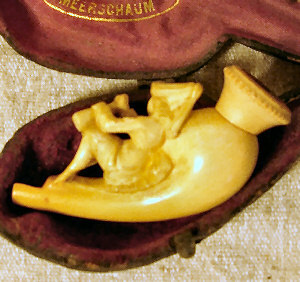 Very often meerschaum pipes and cigarette holders were not purchased to be used for smoking, but rather simply for the sake of the artistic carving. The meerschaum material was very well suited to being carved in fine detail. That made it possible for this tiny man to be so nicely carved.The fact that the mouthpiece is broken off never bothered me because I never intended to use it, anyways. I always considered it more of an artwork than a smoking tool.